Welcome to Bahamas Shark Diving. We are a world-class shark diving charter company specializing in bringing divers from all corners of the globe and of all skill levels up close and personal with the sharks of the Bahamas. 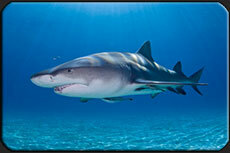 The Bahamas undoubtedly is the shark diving capital of the world. Within this island chain exists some of the best locations to see and dive with the most impressive shark species found anywhere in the ocean. 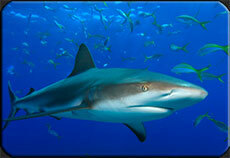 Along with the types of shark species found in the Bahamas, the number of sharks found here is second to none. It is not uncommon to dive with dozens of the target species during your expedition all within pristine tropical dive conditions. 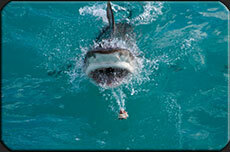 When it comes to professional and recreational opportunities Bahamas shark diving is as good as it can be. The Bahamian islands are one of the few places in the world that protects sharks wholeheartedly, when you add to that lasting untouched waters and remote locations the result is the pinnacle of shark diving on the planet. Names like Tiger Beach, Bull Run, and Tuna Alley have become legendary dive sites among shark divers worldwide. At Bahamas Shark Diving we exhaust every resource and opportunity available to make sure your dive expedition to the Bahamas is one you will never forget and one you will get the most you possibly can out of. Let's Go Shark Diving in the Bahamas! When we take you shark diving in the Bahamas it will be the trip of a lifetime. You will witness wildlife on a level that can only be found in this chain of islands. 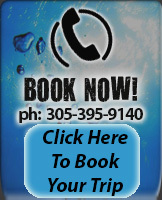 Don't hesitate to give us a call or send us an email for more information.